Where to Fly Into Vietnam: Hanoi or Saigon(HCMC)? Start in the north or the south? For travelers wanting to experience as much as possible, choosing where to fly into Vietnam isn't a straightforward choice. The opposite ends of the country have completely different vibes and offer unique ways to experience Vietnam. Flight prices vary. Even the climate differs drastically by season. Unlike most places in Southeast Asia, you can actually feel cold in Hanoi's winter! Overall, you have three popular choices for flying into Vietnam: Saigon/Ho Chi Minh City (south), Hanoi (north), and Da Nang (roughly in the middle). Flying into either Saigon or Hanoi are the most common ways to begin exploring Vietnam. Before arriving at one of Vietnam's three major international airports, you'll need to have your tourist visa already taken care of or risk being denied entry. Unfortunately, despite efforts to simplify the procedure with a new E-Visa system, it remains wildly inconsistent. Price, processing time, and even whether or not a visa begins running the day it was issued depend on where you applied. The Old Way: Apply at a Vietnamese consulate outside of Vietnam (can be in your home country or another part of Asia) to receive a tourist visa stamp. Visa on Arrival: Use a third-party, government-approved agency to get a visa approval letter. You'll then use this letter to purchase a visa stamp after arriving at the airport in Vietnam. This is most popular way to get a visa for Vietnam but only works when arriving in an airport, not when crossing land borders. E-Visa for Vietnam: On February 1, 2017, Vietnam implemented an E-Visa system. Travelers will be able to upload a scan of their passport, pay the fee online, then three business days later receive an E-Visa via email. The E-Visa is swapped upon arrival for a passport stamp granting entry. Note: There are a lot of fake E-Visa for Vietnam websites. In fact, the real site barely makes the results in search engines! These middlemen sites simply want a fee for submitting your information to the real Vietnam E-Visa site. Fly to Saigon or Hanoi — Which Is Best? Obviously, your planned itinerary and aspirations for the trip may dictate the most logical port of entry in Vietnam. A majority of travelers seem to begin in the south by flying into Saigon. 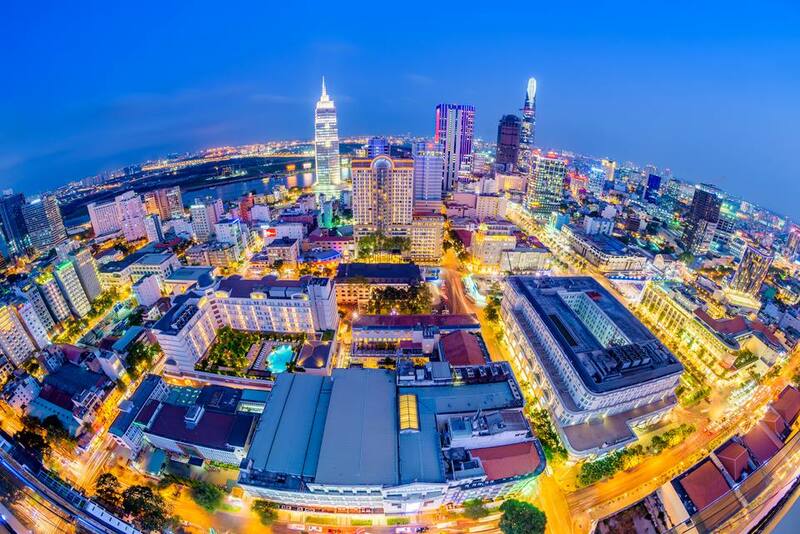 Flight prices are often cheaper for Saigon. Plus, according to many, Saigon provides a slightly "softer" landing culturally for first-timers in Vietnam. This can obviously be a good or bad thing, depending upon your point of view. Because of volume and other factors, flying into Saigon (airport code: SGN) is almost always cheaper than flying into Hanoi (airport code: HAN). In fact, Saigon's Tan Son Nhat Airport (SGN) handles a bulk of all international traffic in and out of Vietnam. The airport is perpetually congested and operating at max capacity. In 2017, nearly 36 million passengers passed through — but the airport's capacity at the time was for 25 million passengers! An entirely new airport is planned, however, it will take years to complete. Hanoi's Noi Bai International Airport (HAN) is the second busiest in Vietnam but handles much less passenger volume. If you intend to see the entire country, consider starting in the south and then applying the difference in flight costs to take advantage of the scenic Reunification Express train. Another option is to grab one of the many budget flights from Saigon to Hanoi when you are ready to go north. The railway runs from Saigon to places of interest in the north, including Hanoi. Overnight buses are another option for moving around, although train travel is certainly more enjoyable for a long haul. Once in Hanoi, you could grab one of the low-cost domestic flights back to Saigon. Overall, international airfare to Western countries is usually cheaper from Saigon. If you're already in Asia, the cheapest flights to Vietnam often originate from Bangkok, Singapore, and China. The state-run Vietnam Airlines handles international flights to Australia, Europe, and the United States. Hanoi's airport serves as their hub. Check prices directly on their site before committing to a fare on a third-party booking site. If fares for long-haul flightsfrom your home city aren't favorable, consider hopping through one of the major hubs where passenger volume to Asia lowers prices. The two busiest examples are Los Angeles and New York. Hopping through Bangkok may reduce the total ticket price, assuming you take the next hop with one of Southeast Asia's budget carriers. For instance, try flying LAX-BKK-SGN or JFK-BKK-SGN. Apply some flight-booking hacks to score the best price. Vietnam Airlines is based in Hanoi's Noi Bai International Airport. They are a member of the SkyTeam alliance; you'll be rewarded with Delta SkyMiles when flying with them. The airport in Saigon is functional, well signed, and easy to navigate. Because the Tan Son Nhat International Airport in Saigon is located within the city and cannot be easily expanded, construction on a new international airport (to be known as Long Thanh International Airport) is already underway. Vietnam's new airport will be located around 31 miles northeast of Saigon and is expected to start handling flights in 2025. The airport will reach full capacity by 2050. Saigon's old SGN airport will be converted to service mostly domestic and regional Southeast Asia flights, much the way that Bangkok's old Don Mueang International Airport (DMK) was utilized after the completion of Suvarnabhumi Airport (BKK). Many hotels provide airport pickup. If possible, go ahead and schedule a driver. Saigon's taxi drivers have a long reputation of scamming new arrivals. Some will demand more money halfway to your destination. Others may try to take you to copy-cat hotels pretending to be one of the current favorites on TripAdvisor! If airport pickup isn't an option, you'll need to enter the taxi stand in front of the airport. If possible, wait for a VinaSun taxi — they are the most reputable taxi company in Saigon. Giving up your place in the queue to wait a few minutes longer is worth it. Regardless of which taxi company you choose, plan to pay a small airport fee directly to the driver in addition to whatever the meter says. This is a legitimate fee, not a scam. Tip: If you have room, keep your luggage on the back seat rather than in the trunk of the taxi. If you need to get out of the taxi after a bad interaction, a dishonest driver may demand more money before releasing the trunk! Your luggage will be held hostage. Hanoi's Noi Bai International Airport (airport code: HAN) is located approximately 21 miles (around 35 kilometers) northeast of the city. If your hotel provides airport pickup, take advantage! Taxis can be an expensive nuisance to negotiate after a long flight. Noi Bai International Airport is the hub for Vietnam Airlines as well as low-cost carriers Vietjet and Jetstar Pacific. All international flights come through the Terminal 2, opened in January 2015. A third option for entering Vietnam is to fly into Da Nang International Airport (airport code: DAD) from another point in Asia. The airport mostly handles traffic from Southeast Asia, China, Korea, and Japan. The only real advantage of flying into Da Nang is to begin roughly in the middle of Vietnam, within striking distance of two very popular tourist stops in Vietnam: Hue and Hoi An. If time is short and getting some clothing made in the cute, riverside town of Hoi An is your primary objective, flying into Da Nang may be the best choice. AirAsia operates flights to Da Nang from Kuala Lumpur's KLIA2 terminal. Save yourself some last-minute hassle by arranging airport transportation through your hotel.The rate is usually about the same as you would pay for a taxi. But having a scheduled driver eliminates potential shenanigans from drivers who know you'll pay a little extra if you're worried about missing an international flight. International flights depart Saigon through Terminal 2. Your driver may ask. An international departure tax of US $14 for adults and US $7 for children is levied when you fly out of Vietnam. Most airlines build the departure tax into the price of your ticket; you'll never notice and won't have to pay in the airport. If for some administrative reason the departure tax is not included in your ticket price, you'll need to go to a counter to pay before allowed to get to the departure gate. A departure tax of around US $2 is also added to domestic departures. Departure Tip: Spend all of your Vietnamese dong before exiting the country. Exchanging Vietnamese dong after leaving Vietnam is nearly impossible. The currency is not useful outside of Vietnam. The airport in Hanoi does not have money-changing facilities on the other side of immigration. You'll be stuck with whatever currency you have left! Getting around Vietnam has its challenges, however, costs are surprisingly cheap given the distances covered. Vietnam's oblong shape means that you'll need to cross a lot of rice-growing regions to reach tourist stops strung out along the north-south route between Saigon and Hanoi. Aside from the most expensive option of hiring a private car with driver, you have three primary options for getting around Vietnam: flights, buses, and trains. Foreigners are typically not allowed to rent or drive cars. Although driving cars isn't really an option, foreigners can get usually away with driving scooters in Vietnam without a Vietnamese license (technically, you are supposed to have one). Before hitting the streets on two wheels, make sure you've got what it takes to contend in the famously congested roundabouts of Saigon or Hanoi. Even crossing the street on foot can be a daunting challenge. Scooters are a great way to reach the sights in smaller places such as the sand dunes in Mui Ne. Many intrepid travelers even opt to drive motorbikes between Saigon and Hanoi to see the country at their own pace. Agencies help you sell it back to someone planning to drive the other way. Driving in Asia can be challenging, but driving in Vietnam takes the "excitement" to a whole new level! Clear promises quicker airport screening with our without TSA PreCheck. What Airport Should You Choose When Flying to Virginia?